Both my targeted, egg-eating Browns & RainBows are not migrating upstream from the local reservoirs in good numbers...yet. HINT: fish the inlets where they are staging. In the interim were having some fun fishing for the local Kokanee. Stay clear of the Kokanee's needle-sharp teeth! During the last few days, gusting winds have severely impacted our casting; whether angling local still-waters or streams. These strong winds occur early-afternoons. Seems like the weather is in a cusp period; late-fall into an early winter. The past six weeks we've been blessed with classic Fall weather; soft-breezes, cirrus-laden clouds, blue sky and clear, cooling waters. During the period we've encountered surface feeders confidently ingesting the occasional hopper (...the remaining few are active during the warmth of mid-day) and "slurpers" sipping the minutest of BWO's, PsuedoCleons; spinners and emergers. Personally I've not observed the fabled, humongus October Caddis; locally very sparse, unlike the immense numbers on NorCal's McCloud and Upper Sacramento rivers. 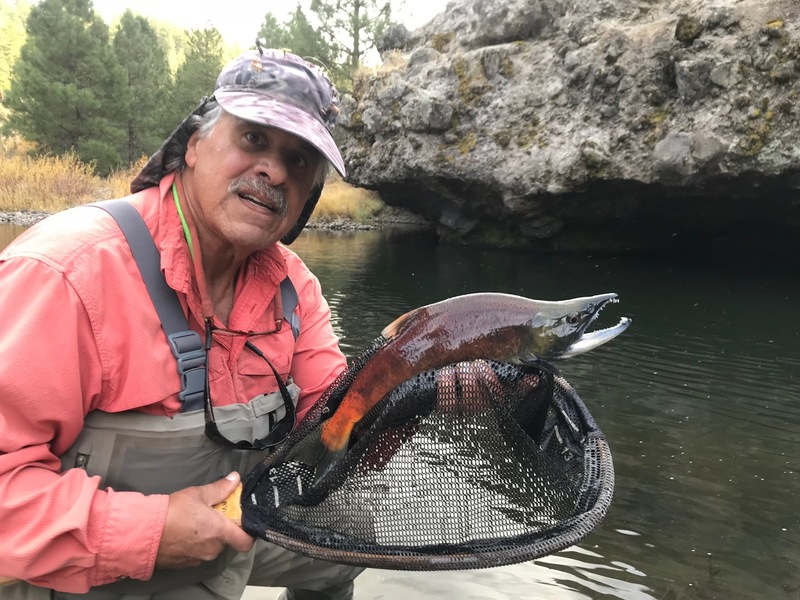 BT dry/dropping the pockets...along "Glenshire"
While many anglers are currently obsessed with the huge Lahontan Cutthroat at Pyramid Lake; now is the time some Truckee anglers start thinking about fishing for the big Browns of fall-time. Our "fly" of choice is that of an egg imitation. Personally I do not "peg" a plastic ovum pattern. I use yarn, egg imitations; many anglers call them "Glo-Bugs". I will experiment fishing with different colors, in light and dark shades; finding-out which produces best. Tactically, we do not fish on/in spawning redds...unethical! We look for that first riffle and/or vertex of currents below the redds. I always trail a smallish fly pattern (midge larva or BWO nymph) behind my egg fly. You'll be surprised what may eat the trailer...could be a big brown. About 10 years ago I netted a 24" Brown which ate a #20 Black Midge emerger...a unique occurrence for inclusion into the "20-20" club. Recently I received an egg-tying lesson from long-time Truckee guide and expert fly-tyer "JR" (John Roberts). I was enlightened as to how the circular, yarn patterns were made. I had envisioned the tyer meticulously scissor-cutting/trimming the yarn into a perfectly round globe...I was wrong.